RubyURL was a project that I built about 2 1/2 years ago as a late night attempt to see what I could build and deploy with Ruby on Rails in a night. It’s nearing 50,000 unique website links, has a Ruby gem that you can use with it, and rbot plugins. I’ve rewritten it about three times in the past six months, to try out some new approaches, but haven’t deployed with a new version as I’ve been waiting for someone to help me with a new design. Chris has offered to help out and once we integrate his new design with it, we’ll be launching it. Everything is not great in RubyURL land though. It appears that it’s become an easy target for comment spammers to abuse the site to generate rubyurls and paste those links in their spam comments. Several pissed off bloggers, forum administrators, and system administrators have emailed me to complain that I’m spamming their site. Sadly, even with a basic disclaimer on the site, they still like to blame me for their spam. It’s gotten common enough, that I’ve written a template email that I respond with that explains how the site works and that I’m not accountable for people posting links to my URL redirect tool. You can see that it’s popping up around the net via a google search. So, I’ve been trying to think of ways to make it easier for people to flag URLs as being abusive of the site. I’ve not come up with any elegant solution that doesn’t force the good users of the site to have more steps in their process to create a basic RubyURL. Some people have suggested using a user system to do this, but I really don’t like that as a solution. Another idea, which I built… and later removed from my new version, involved having the original url load in a frame, and then provide a way for users to flag it as ‘spam’, ‘nsfw’, or ‘dead’. Then, we could provide the user with a warning that the following URL was flagged before, are you sure you want to continue? I didn’t like this as a solution in this way as it felt very obtrusive to have a rubyurl frame at the top of the browser window. One person suggested a captcha to try and verify that the user is human, but there are problems with this. This doesn’t prevent spammers from using the ShortURL gem, which does everything via an API. In regards to the API, this could be enhanced by requiring that everyone register an email address to get an API key, but only solves the API abusers. So, I am curious… dear readers of my blog. How might you solve this problem without disrupting the user experience? Or, should I just stick with what I’ve got going and find a better way to respond to pissed off bloggers who think I’m spamming them? 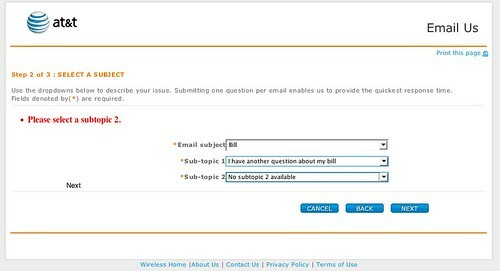 So, I was trying to send AT&T wireless a support email through their online system and got stuck at the following screen. Come on guys… you can design a better form than this… and I’m now going to have to try and sneak in a question under a sub-topic that doesn’t apply to my question… just so I can send you an email? Getting help shouldn’t be so hard1. In an effort to increase awareness of the importance of good Interaction and Interface Design in Web Development… I suggested that today be... Hug Your Designer Day. 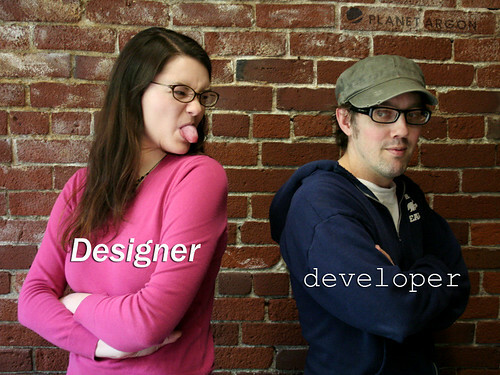 Are you seeing a lot of this in your Design and Development teams? Also… to celebrate Hug Your Designer Day, Amy Hoy was kind enough to post her slides and some audio that I recorded of her talk at RailsConf 07. Amy Hoy, of slash7 fame, gave a talk titled, Rubber, Meet Road: Getting Designers Running with Rails, which provided a good overview of some of the problems that designers and developers face when working together. This was one of my favorite talks, because she essentially explained several of the problems that our team has faced in the past and in many ways, still encounter from time to time. A few things that I was surprised to hear, was that several companies leave their developers to implement HTML/CSS in the Rails applications, rather than let their designers into the area. Some teams, provide a directory in public/ for their designers to write their HTML/CSS. Amy said that she preferred to work in the standard view directories (as a designer), which is exactly how our team works. In fact, I agreed with Amy on several points. Template languages create extra barriers to training designers. Stick with RHTML… designers won’t be afraid of ERb syntax if you sit down with them and explain some of it. Move the ugly stuff to helpers… like you should be anyways! When meeting clients with a designer and a developer… don’t let the developer speak too much about implementation when it hasn’t been designed yet. Interaction Design should dictate architecture not vice-versa. I’d like to personally thank Amy for being a diplomatic designer and telling the hundreds of developers that showed up for her talk to remember that designers and developers… think differently… and that’s a good thing for the application and ultimately… the user experience. Having said that, I’d like to request that tomorrow, May 23rd, be… Hug Your Designer Day. There are some discussions within the comments on the blog post about the design decisions that were made, some of which we’ve already begun to address in our redesign process brainstorming (based on google analytic conversion data). On top of that, today is our Experience Director, Allison Beckwith’s, birthday. Thanks for the linkage, 37signals!